He said the main difficulty was “to link Eastern and Western cultures; to cross historical and geographic boundaries”. Louvre Abu Dhabi is designed by Pritzker laureate French architect Jean Nouvel. The world famous French architect has already made his notable contribution to link the East and the West 20 years ago by designing Institut du Monde Arabe in Paris. His new challenge in the Middle East has its design concept on the cupola, a dome. He said in a statement that it was a major sign of Arab architecture and also a form common to all civilizations. The dome is made of “a web of different patterns interlaced into a translucent ceiling which lets a diffuse, magical light come through in the best tradition of great Arabian architecture,” he said. 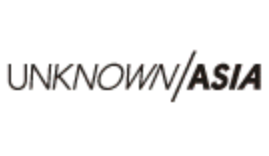 This web patterned dome also conceived as a global link of culture by Nouvel. 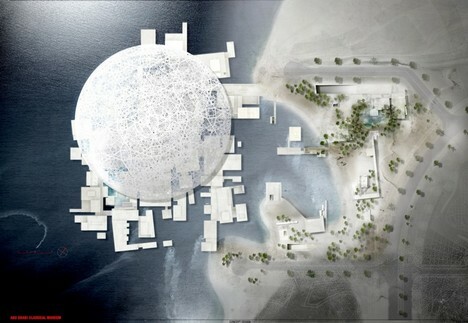 This dome will be located in the island of Saadiyat with its extraordinary landscape of desert and sea. Separated from the shore by a lagoon and surrounded by floating gardens, the museum seems to hover just above the water’s surface. The cupola seems a massive building at a glance. 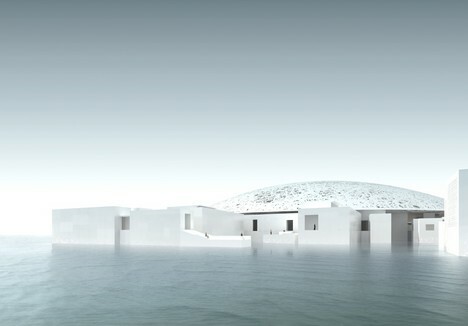 “Louvre Abu Dhabi has been influenced by elementary observation,” Nouvel explained in a statement. The double-layered 180 metre dome was created to house a “micro-city”, said Nouvel. “This micro-city requires a micro-climate that tells visitors they have entered a different world,” he said. He describes it as an “archipelago in the sea protected by a parasol” with a calm and complex atmosphere. “Humans are fragile for a temperature change, works of art too,” he added. This “museum micro-city” resonates with both the classical past that is the focus of the art objects and cultural artefacts and the Islamic cultural context in which it is situated. 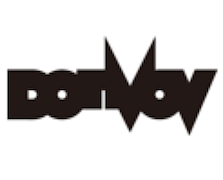 Nouvel’s concept is that he wants it to belong to a country, with its history and geography, without in being a mere tasteless translation. The future vision of Sheikh Khalifa Bin Zayed Al Nahyan, the president of the United Arab Emirates and ruler of Abu Dhabi, is for Abu Dhabi to become “a cultural asset for the world” and a “beacon for cultural experience and exchange”. The two countries working together will not only lead to the creation of a historic museum, but will also put Abu Dhabi on the map as a crossroads of Western and Middle Eastern culture, as per the president’s vision. 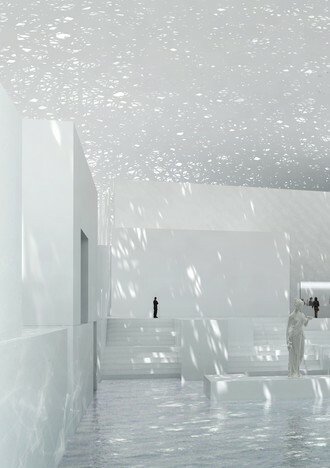 It has been finally announced that the Louvre Abu Dhabi gathering attention will be in 2016 second half. It is possible to check the latest updates and event information at Facebook page as “Louvre Abu Dhabi“.